Successfully Added Ultra Portable HDD Enclosure and Media Player for 2.5 Inch SATA to your Shopping Cart. Ultra portable HDD enclosure and multimedia player for 2.5 Inch SATA HDD's. This enclosure functions as a convenient portable storage device and media player for connecting to your TV. Take those old internal hard drives you have lying around and breathe new life into them with this great new HDD enclosure for SATA drives. Supporting hard disks up to 160 GB, this model is perfect for storing all those MP3 and MP4 files you want to keep, but want off your main PC. Better yet, use this external HDD to back up your important documents! This portable HDD device also comes in handy when you are transporting files from work to home and your USB key or SD card just does not have the capacity for the job. 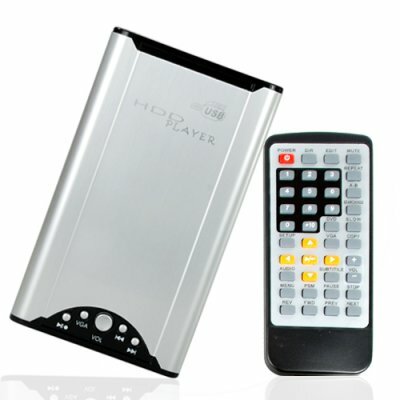 Attractive and sleek, it also functions as a versatile standalone multimedia player. Plug it into a TV or monitor and play files without a PC! View photos, listen to audio, or watch movies with this unit. It supports many popular file formats like AVI, DIVX, XVID, MPG, VOB, MP3, OGG, and more. A great feature set and direct to you wholesale price make this HDD multimedia player + storage drive enclosure worth adding to your online store or buying for company/personal use. Hard disk drive (HDD) NOT included. The HDD you use must be a SATA drive and needs to be formatted for the enclosure to be able to operate. 2.5" SATA HDD enclosure to be used as a media player or portable storage drive. Media player function handles most popular video and audio digital media formats. Enclosure works with remote and has built-in buttons for quick media access. What are the advantages of this model versus others I have seen? Attractive, sleek, and sturdy, this model comes in a silver metallic finish and solid construction to protect one of your most important assets - data. Who needs an external HDD enclosure? Everyone. Backing up important data should be a priority for anyone living in the modern digital age. In addition, transporting files in excess of tens of GB's can be a problem for most USB drives and SD cards. This unit supports HDD devices up to 160 GB so it is perfect for the home or office. + It's very cheap, small and good looking. Package contains all necessary cables (except a RCA-Scart adapter if you need it) and a small screwdriver! Very easy to use, like an external HDD. - It doesn't support Greek subtitles, and we don't have any information about firmware. Finally, I decide to use AVIAddXSubs, and that's the solution to my problem. Other thoughts: Manual claims that it supports only fat32 format, but that's not true. NTFS also works great.